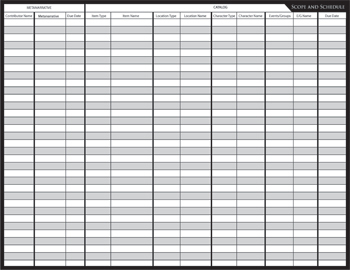 The Worldbuilding Structures Worksheet is used to record the values of the structures and substructures of your world. For each substructure, circle the number from 1 to 5 and whether the value is trending or stable. If it’s trending, circle the appropriate directional arrow. For example, if Government Presence is a 3 trending to a 4 in your world, circle the number 3 and the arrow pointing in the direction of number 4. In the early stages of the worldbuilding project, it’s useful for everyone in the group to have their own copy of the structures’ numeric values and a place to jot down a flurry of notes and ideas. Transferring the values from the card deck to the worksheet also saves valuable tabletop space as you continue to work on your project. 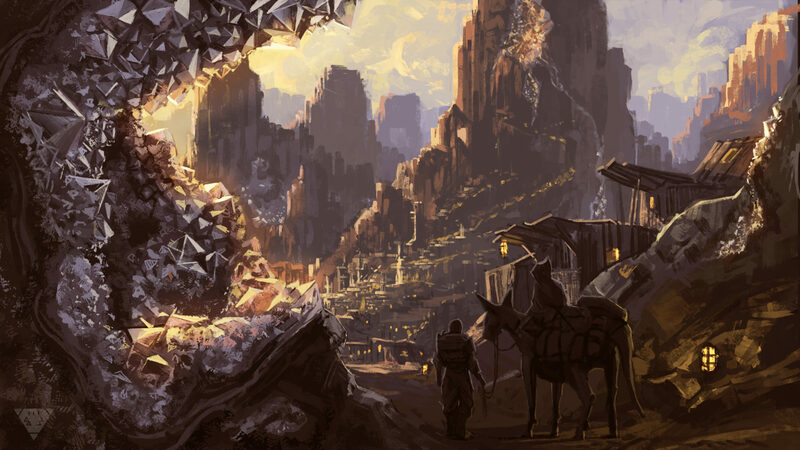 The concepts of structures and substructures are covered in depth in Chapters 5 and 10 in Collaborative Worldbuilding for Writers and Gamers and as Appendix A. 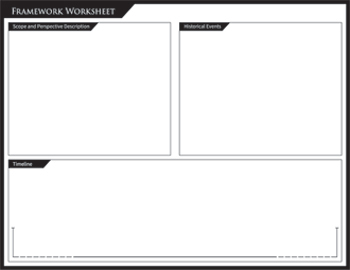 The Framework Worksheet has three boxes: one is for recording the world’s scope and perspective; one is for writing down major historical events that shaped the world, and the largest box across the bottom of the page is for marking those historical events on a sequential timeline. These terms and concepts are expanded upon in Chapters 4 and 9 of Collaborative Worldbuilding for Writers and Gamers and as Appendix B. 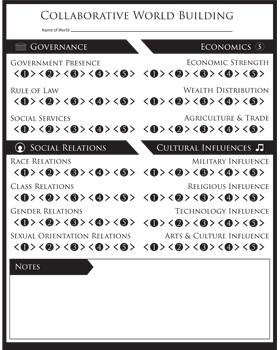 The Scope and Schedule Worksheet helps keep your worldbuilding project on track and on schedule as your transition to populating the catalog with people, places, and things. Essentially, it’s a spreadsheet used to record which contributor agreed to create which entries, and the date by which the contributors agree to complete them. It also ensures that your world will have a diverse set of entries. Scope and schedule are discussed more in Chapters 9 and 10 of Collaborative Worldbuilding for Writers and Gamers and as Appendix C.